Any ETP including VXX is a derivative of some underlying asset so let’s take a look at the underlying “asset”. In this case it’s the VIX futures. The VIX itself is actually a calculation based on the implied volatility of a basket of options on the S&P 500. Included in the calculations are options which are about to expire and those with 30 days to expiry. The net result is what amounts to a best guess as to what the market believes is in store for the next 30 days trading. Attentive readers will realise that the VIX is therefore not the actual volatility of the S&P 500, but rather a forward looking best guess of what it is. For example it’s possible for actual volatility of the S&P to be low while traders are freaking out about something they see in a months time which would send VIX higher. You can buy futures contracts on the price of VIX and they’re actively traded but like any futures contract you’re betting on a where a price lands on a future date, in this case 30 days out. Volatility ETF’s are particularly strange animals since you’re buying a derivative (ETF) on a derivative (the futures contract) which itself is based on a derivative (the implied volatility of options) and those options themselves of course are derivatives which themselves are based on the S&P 500. So what’s going on with Volatility ETP’s? Volatility ETP’s can provide investors the ability to be bullish or bearish. In other words those expecting low volatility can buy something like the ProShares S&P 500 Low Volatility Portfolio (SPLV) and those expecting high volatility can buy something like the VXX mentioned above. It’s one thing that investors are expecting continued complacency and thus buying the low volatility ETP’s but there is a perverse craziness that makes it all the more dangerous (more on that in a moment). To explain why there has been such a rise in the popularity of low volatility ETP’s just imagine driving the Eyre highway which takes you across the Nullarbor plain in Australia. For those unfamiliar with what this is, it’s a 1,675km stretch of road that is pretty much dead straight and has nothing to see – nada. It is I assure you, more boring than watching grass grow and takes 2 days at high speed. The thing is you land up clocking speeds that would get you arrested anyplace else, in large part because it doesn’t feel like you’re going that fast and certainly doesn’t feel like you’re getting anywhere at all. It’s why when accidents happen on the Eyre highway they’re more often than not fatal. Every 50km or so the road kinks a little and so one minute you’re hurtling along and the next thing you know, the roads not there anymore and you’ve got to control a ton of metal and rubber screaming through the outback at 180km/h. The rental car guy I spoke to told me that about 10% of all his cars are never resold, they’re rolled. What does this have to do with volatility ETF’s? Betting on increased volatility has been a losing bet. Below is the VXX in blue (long Volatility) vs SPLV in red (Short Volatility). Now there are structural reasons why VXX is such a pig of a long term ETF to buy, and I’ll cover why that is in a future article but the point I want to make is that going short volatility has been a winning trade. I’ve written about this so much that my fingers are going to bleed, more recently when discussing how bonds no longer trade based on yield but based on a future price but the hunt for yield has created some truly amazing set of circumstances and this brings us squarely to low volatility ETF’s. Now this is where the perverse part comes in. Bear with me on this – it’s important. Every time you sell volatility you get paid by the counter-party who is typically hedging the volatility (going long) of a particular position and paying you for the privilege. This is not unlike paying a home insurance premium where the insurer takes the ultimate risk of your house burning down and you pay them for the privelage. The difference however between selling volatility in order to protect against an underlying position and selling volatility in order to receive the yield created is enormous. And yet this is the game being played. The Central banks have managed to create a sense of calm in the markets exhibited by record lows in volatility and for their part Joe Sixpack investor has used linear thinking extrapolated well into the future assuming ever greater risk ignoring market cycles and extremes at their peril. When the proverbial house burns down the insurance company (ETF) can’t cover. It’s all in and was never designed to protect holders for the inevitable reversal. Investors have been selling volatility in order to achieve yield and thus treating these structured products like bonds, when they are in fact similar to bonds in the same way that the iPhone is similar to a water buffalo. Traders are aggressively hunting for yield and finding it in selling volatility. This works wonderfully…until it doesn’t. Remember equities are something like 7x more volatile than bonds (depending on what you’re looking at) and these ETP’s are inherently more volatile than the underlying equities upon which they’re ultimately priced. Treating them like bonds and buying them for yield is quite simply INSANE. What’s interesting is that the VIX is trading near all time lows at the same time that short interest on low volatility ETF’s is at record highs. While I’m not predicting it though we are due a recession purely based on the business cycle, a market crash would almost certainly wipe out the entire low volatility ETP complex, and a market correction (overdue) will see a scramble amongst those who’ve been treating an ETP as a bond. It could be more entertaining to watch than the current clown show US presidential race. 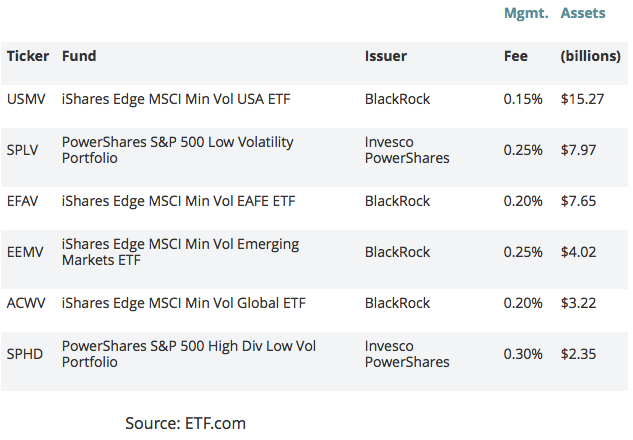 Do the majority of buyers of low vol ETPs understand what they are actually buying?